Happy news! A grant for better heating and lights! Today, we received amazing news. 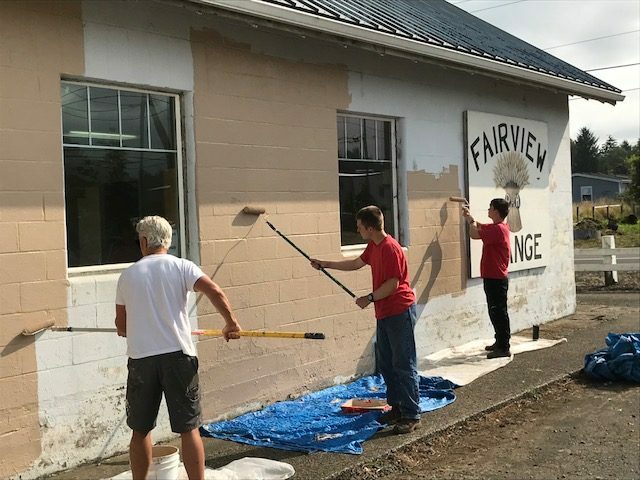 The Tillamook Public Utility District, our consumer owned public electrical utility, awarded us a Community Service Grant for $5000, to help us begin to upgrade our heating and lighting system, and bring energy efficiency and cost savings to the Fairview Grange. The PUD conducted an engineering study for us in November, which demonstrates our need for modern heat pumps and LED lighting, and other electrical needs, and now we can begin to move ahead. The new heating and lighting will allow us to make the Grange more comfortable for the community, and all the numerous community events we are now scheduling at the Grange. And, our finances will improve, due to the efficiencies of the new systems. We are very grateful for the PUD for their charity, advice, and community spirit. And, we will apply for other grants and donations, so that we can move ahead with improving the Grange. We rejoice that we live in a generous and community-oriented community. Thank you, PUD! Lots of things are happening at the Grange. Our March open mic and community supper is tonight, March 2, starting at 6. Soup and salad dinner by donation, and then our monthly open mic happens, with a variety of local poets, story tellers, and musicians. We are family friendly so come on down. March 6 the Wilson River High School holds a workshop at the Grange. March 10 is the Tillamook High School charity drive celebration, to honor another successful community wide fund raising campaign. March 22 is the Serenity Club’s dance, with music by Benny and the Bay City Rockers. The Rockers return on Friday, April 5 for a benefit concert for the Fairview Grange, starting at 6:30 p.m.
And, then, Saturday, April 6 is our monthly Open Mic and Community Supper. The Grange will be featured in the April edition of the Tillamook PUD Ruralite magazine, with stories about our recent activities and plans for the future. We’ve also been busy applying for grants, including a revamping of our electrical system and heating with the Tillamook PUD. We’ve also applied for funding for a summer workshop for young musicians on how to perform on stage, and use a sound system. We’ll keep you up to date as we move forward, and continue our renovations and improving the Grange, being a good host for a variety of community events and activities. December continues to be a busy month at the Grange. Tuesday, December 4 brought the Tillamook High School choir to the Grange for a special holiday concert. It was lovely to hear all those young voices bringing holiday cheer. Friday, December 16 will entice the artist in you to experience a paint night, where you will work under an art teacher to create your very own acrylic painting, and enjoy homemade pie. “Paint and Pie Night” is a fund raiser for the Tillamook Serenity Club. All the supplies are provided; just bring your artistic talent. The Grange will be decorated for the holidays, with live trees, lights, and a Christmas village. There’s still time to book your Christmas party and other events! It is a new beginning at the Fairview Grange. This summer has been a whirlwind of renewal. We cleaned, scrubbed, and painted. And, painted some more. 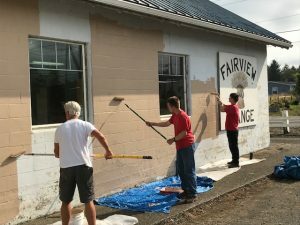 We enjoyed painting so much we invited the Oregon Youth Authority work crew over for six days of scrubbing, scraping, and painting. The paint recycling project at Tillamook County Solid Waste recycling project brought us a load of five gallon buckets of recycled paint, and we were regulars at the paint departments of local hardware stores. The ReStore store of Habitat for Humanity helped us with “new to us” appliances. Students from the Wilson River high school helped out, too. Soon, fresh coats of paint covered the kitchen, the dining hall, and even outside. People driving by honked and gave us the “thumbs up” as we worked. The east porch and doors were painted, and so were the bathrooms! If it didn’t move, it probably got painted. We spruced up the kitchen, too, adding a new refrigerator and microwave, and a second stove. We rewired the stove plug ins and now have a nice area set aside for the stoves. The entrance to the performance hall was cleaned and painted, with some areas getting fresh paint for the first time since the 1940s. Everything is fresh and clean! There’s been a few gatherings since all this work has been done, and the public’s response has been enthusiastic and exciting. Once again, the Grange Hall has been filled with community members enjoying a meal together, and listening to local musicians. This weekend, we are holding our first Open Mic in the refurbished hall, inviting poets, storytellers, and musicians to share their creativity and allow the community to come together and celebrate our culture and our commonality. We are again open to renting the Grange for weddings, anniversaries, parties, and other community events. Several youth groups are already coming every week and enjoying the Grange. On November 17, we are planning a grand “Reopening” party, with food and music and celebrating our community! See you then! It has been busy summer at the Fairview Grange! We have recommitted ourselves to do some serious cleaning, and freshen the hall up with new paint everywhere! We’ve made serious headway. The dining room is freshly painted, as is the kitchen, and much of the dance hall. The stage has been redecorated and painted. The piano is on the stage now, and will soon be retuned. New track lighting has been installed, giving the stage a fresh, bright look. The proscenium and the backdrop have a new color scheme. Another change is the entrance to the dance hall which has been completely refurbished and repainted. As well, the bathrooms have been thoroughly cleaned and new paint is everywhere. The exterior now boasts a fresh, new paint scheme on the east and south sides. As well, the kitchen boasts a second stove and a new refrigerator. Fresh paint there has brightened the area up. This fall will bring even more changes, and some additional community events.